The group’s president has admitted the sum was “not sustainable and unacceptable”. THE IRISH FARMERS’ Association’s top official who stepped down from his post amid a pay controversy had a salary package worth more than €500,000 in 2013. General secretary Pat Smith fell on his sword yesterday after weeks of pressure over the organisation’s non-disclosure of his pay packet and claims he earned more than €400,000 per year. He said the IFA was “bigger than one person” and he had “decided to put the best interests of the association to the fore”. “It has been a great honour and privilege to work with IFA for the past 25 years,” he said. The IFA called an emergency meeting today, when president Eddie Downey revealed Smith received a package of €445,000 last year, according to the Irish Farmers Journal. That included a salary of €295,000 and a pension contribution of €150,000. The previous year, his package was worth €535,000, a sum that also included a €60,000 bonus and €30,000 director’s fee. He received a company car as part of his package both years. In a statement this afternoon, Downey admitted the former general secretary’s pay package was “not sustainable and unacceptable”. Smith’s sudden resignation followed calls since the start of the month for his salary – and that of other top IFA officials – to be publicly disclosed. Carlow dairy farmer Derek Deane, who lost a previous bid to be IFA president, claimed the general secretary was paid over €450,000 in 2013 during an interview with RTÉ Radio 1′s Drivetime programme earlier this week. I think this is totally unacceptable at grassroot level in the association and that’s why I felt it so important to make a statement on it,” he said. The €535,000 package compares to a total budget for the organisation of about €12.5 million in 2013. The IFA does not publish details of the remuneration for any of its senior staff. Smith’s basic salary was significantly higher than the taoiseach’s pay packet, while it stands at more than 10 times the earnings of most farmers. The average producers’ income was just under €27,000 last year, according to Teagasc’s national farm survey. 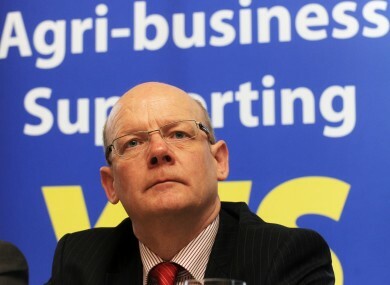 Deane and several other IFA country chairmen first moved a motion of no confidence against Smith in January, but the attempted putsch was defeated by Downey and others. Speaking on RTÉ’s Morning Ireland this morning, independent TD Michael Fitzmaurice said the €450,000 figure that had been floated appeared “an exorbitant rate” for a member-based organisation with the IFA’s budget. The farmers on the ground are demanding that whoever is chairman, secretary, treasurer, whatever … that it’s out to the front, the salaries that they’re on,” he said. Fitzmaurice said the understanding “down through the years” in the IFA was that senior positions in the organisation were effectively unpaid. (We understood they were) covered for their diesel or their petrol going somewhere and that if they needed a worker on their farm that was being covered,” he said. The IFA has already pledged to set up a revamped remuneration committee, but for his part Downey backed Smith. Yesterday said the general secretary’s resignation was “very regrettable and a great loss” to both the association and Irish farmers. Email “Here's exactly what the IFA's top official was being paid before he resigned”. Feedback on “Here's exactly what the IFA's top official was being paid before he resigned”.